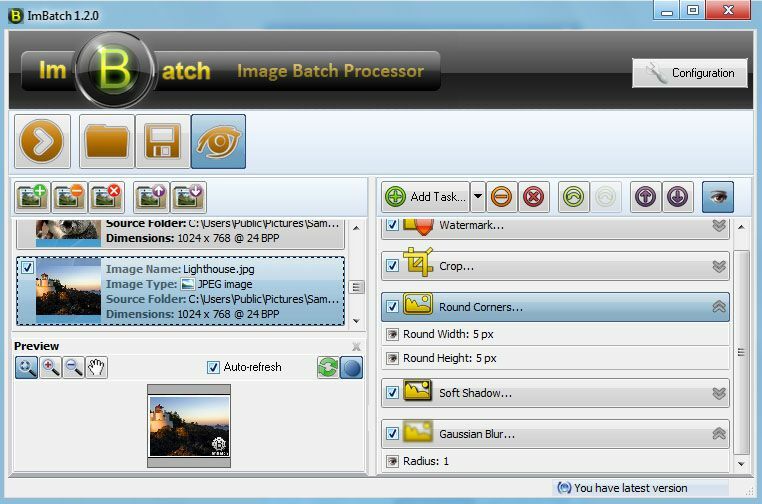 http://www.highmotionsoftware.com/products/imbatch wrote: ImBatch is a free image processing tool for your Windows PC. With the help of ImBatch, users can perform a variety of complex image editing tasks; applying those changes to hundreds of images at once. Whether you’re looking to crop, resize, rotate, add/remove tags or convert image format, ImBatch provides users with dozens of editing tools. Latest ImBatch release (currently v3.6.0) changelog and download is at www.highmotionsoftware.com/download-center/imbatch. I am a developer of ImBatch program. It is a batch image processing software for Windows. We added "Portable" installation type in the latest release and today one of our users suggested to submit ImBatch to portablefreeware.com. I read that I have to wait a week after registration to submit, but still have some questions. My program is "Free for non-commercial usage", so I am in doubt - do you accept such programs? There are no actual limits in free version. Also, the program is distributed as executable installation file now with the option of Portable installation, when all the preferences and configs are stored in the same folder where the main executable file is located. Is it OK or there should be a separate .zip file with all required files instead of the installation file? 2. There should not be an issue with the license; TPFC includes programs that are "Free for non-commercial usage". 3. A separate archive (.zip / 7-zip) for the portable version is preferable. The installer requires administrator privileges and leaves traces behind. Also, the Portable installation launches http://www.highmotionsoftware.com/produ ... h/thankyou and starts the program instantly upon completion. This should be users' choice. Also, the Winter 2003 skin is buggy: I got error message "The parameter is incorrect"
Thanks for your interest in putting together a portable version and for reaching out to us. Thought that was familiar. Merged. Please move to the submission sub-forum. Thanks. Thanks for following up on that. Moved to Submission. Does anyone know if components are portable? ContextMenuEditor probably isn't but ImageMonitor.exe (essentially runs batch operations on a given folder) might be. Very nice. I'm so far very impressed by this program. Today I tested out the save-for-web feature with good results. FileOptimizer and PngOptimizer both were able to take it down even smaller but I work with a lot of screenshots and this does some things that RIOT can't (although RIOT is still great). - Added option to turn on/off beep sound in the end of processing. - ImageMonitor: added totally silent mode. - Added replacing transparency with white color while saving into the format, that doesn't support transparency. - 'Resize Canvas' task: added the option to fill new space with blurred image. - 'Convert Colors' task: added ability to replace alpha channel with the specified color. - 'Save As' task: fixed changing 'Common Folder' option after loading task list. - 'Resize' task: fixed working 'Resize Type' option in Preview panel. - Improved algorithm of the Deskew Text task. - Fixed saving into DDS format with transparency. - Fixed detection of the portable version by the path to the program. - Fixed opening 'Save As' task. - Fixed image size updating in Preview panel. - Added multithreaded task list processing! In other words, ImBatch can work much faster now. - Added Image Selection Tool. - Added ability to sort images by all attributes. - Added ability to save lossless transformations for JPEG (flips and rotations). - Improved tooltip for images (more info plus large thumbnail). - 'Watermark Text' task: improved text rendering with Anti-Grain Geometry library. - 'Watermark Text' task: simplified access to font parameters. - 'Watermark' task: fixed disabled state of task's interface. - 'Rotate' task: fixed image sizes update for preview. - Added "Save In CMYK As" task. - Added "Save To Animated GIF" task. - "Save As" task: added extended configuration options for TIFF and DICOM formats. - "Set Tag" task: added support of image and file attributes for the text tags. - "Watermark Text" task: added the ability to wrap text. - Added the ability to set templates for date/time tags. - Selecting color from the screen: fixed work with multiple monitors. - Selecting color from the screen: added the ability to cancel the color picking. - Fixed a rare error that happening while simultaneously updating the preview and loading image for hint. - "AutoCrop" task: fixed processing the preview. - "Save As" task: spaces in the name are replaced by underscores. - "Save As" task: fixed error when saving in multi-threaded processing. - Image Monitor: fixed error on loading of the non existent folders on start. This nag screen is something new- it does not appear in ImBatch version 5.0.0. I didn't investigate whether version 5.1.0 had introduced other nice undocumented surprises because I immediately reverted to version 5.0.0 so if you don't like nag screens don't update to version 5.1.0. ImBatch Personal License is sold for $29.95 and only "Free minor version updates" are allowed. I think that greed is as infinite as stupidity, about the universe- I concur with Einstein. What a singularly useless message. What percentage of their users are even using command-line operations? Isn't the whole point of a batch interface to avoid getting your hands dirty on the command-line? It doesn't even have a "make this message go away" buy button. Part of me wonders if this is just one of those moments where the dev got one or two aggravating messages by unhappy users concerning command-line limits so they added a nagware element as sort of a middle finger to those specific users. Hopefully it goes away. "Resize Canvas by Aspect Ratio" task: Added the ability to fill the background with the blurred source image, added background transparency setting. "Resize Canvas" task: Fixed wrong blurred background with some specific options set. "Save as Animated GIF" task: fixed delay time between the frames. This is a good news, ImBatch is usable again. Added "Gradient Paint" batch task. "Curves" task: added the ability to save/load from Adobe Photoshop's curves files (*.acv). Added the ability to turn on/off auto-rotating of images based on orientation tag information. Added the ability to close Selection window by pressing ESC key. "Save to PDF" task: fixed saving multiple images to the single PDF file. 'Resize Canvas' task: added the ability to specify the size via the width and height. 'Fill Color' task: added the ability to set the transparency for the filling. Added command line options (/? and -?) to display help about ImBatch command line parameters. 'Gradient Paint' task: fixed gradient reset. 'Watermark' task: added localization of some controls. 'Watermark' task: fixed the size of watermark border in the preview window. 'Save As' task: fixed saving to ICO format. 'Stroke' task: added the ability to create a border for images without transparency channel. 'Fill Color' task: fixed fill of images with semi-transparency. Replaced some non-Unicode function calls to Unicode versions of the functions. Fixed displaying of the "Add pages" form. Fixed writing to the log. 'Remove EXIF/IPTC Tags' task: Added the ability to remove XMP tags or full meta-information from JPEG images without recompression (lossless). ImageMonitor: Added the ability to show error messages in a tray in stealth mode. Replaced some non-Unicode controls to Unicode version. Increased the default quality level for JPEG.